Militracks is on Saturday 18 May and Sunday 19 May 2019. The military collectibles market opens at 09:00, at the same time as the gates to the grounds open. The vehicles begin driving starting at 09:30. From that time, there will be on-going rides, with a short lunch break at noon. Militracks lasts on both days until 17:00. New this year will be the Restoration Centre, a technical workshop where skilled craftsman (in German: Handwerksmeister) will show you how they restore historical vehicles. We think that there will be a lot to see and a lot to learn. Riding is in principle possible the entire day, but there is naturally no obligation: Militracks is namely, above all, a sociable event where people with technical interests can meet each other, exchange experiences or make purchases at the large military collectibles market. 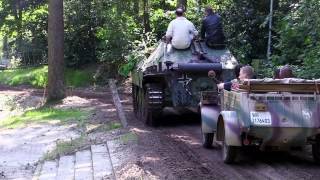 The location in the woods, with the museum within arm’s reach, makes a day at Militracks an absolute pleasure for young and old.